Drive A leaves from Black Stallion Motors at 13 Pilgrim Court, Ringwood. We travel up to Olinda via Ferny Creek and then on to Monbulk via a few nice twisting mountain roads. 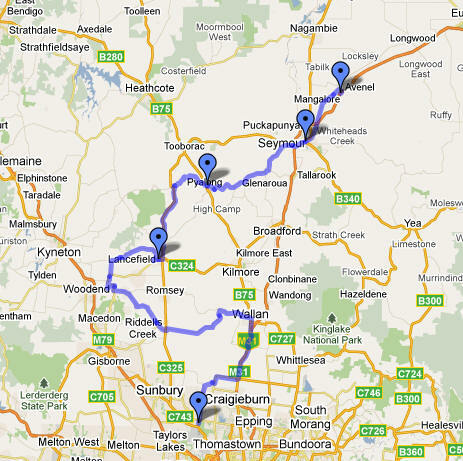 Next stage is into the Yarra Valley via some fast and flowing open country. Most of these roads are infrequently travelled, especially during the mid week but watch out for the farmers in their utes and tractors. 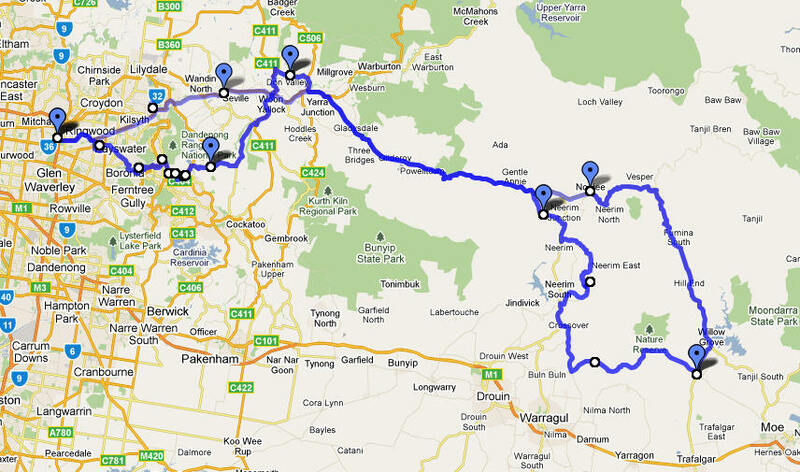 We weave our way through the Yarra Valley and will stop and regroup at Yarra Junction. There are facilities here to grab a snack or a drink whilst we wait for any stragglers. Once regrouped we head off to Powelltown, Nayook and Willow Grove before arriving at The Toolshed Bistro in Noojee for our lunch stop. The roads between Powelltown and Noojee are glorious, winding back roads. Many of the roads we will be using are single lane so be aware of oncoming vehicles. All roads on this route are fully sealed, but be aware that they do have many intersections with gravel roads so at some junctions there may be a bit of gravel and dirt so keep a bit of distance to the car in front to avoid stone chips. The Toolshed Bistro is a privately operated country tavern. It's very rustic but serves good food (bar style) and cold drinks. There is a nice big open fire which does a pretty good job of keeping the place warm, but it can get mighty fresh in this area, so bring something warm to wear for when you are out of the car. 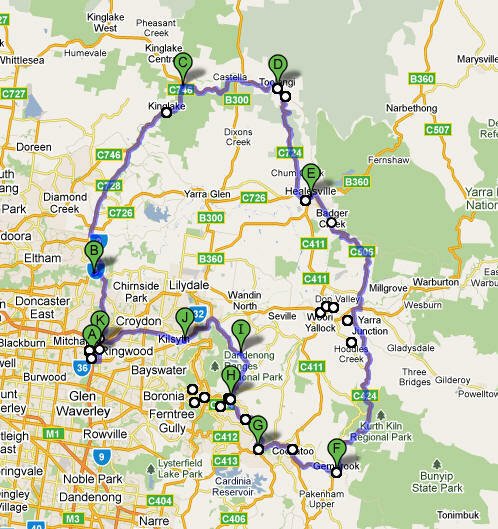 Our route back to Ringwood follows the Powelltown Road in reverse but then we follow a different path through Mt. Evelyn and Mooroolbark back to Ringwood. The map of the route is below. Use the +/- scale on the left to change the zoom level of the map. There is a link at the bottom of the map to view the map in a larger size. Follow this link and the map will load in a new page and give you full route instructions, turn by turn, for this drive. These can be printed off and should be carried with you on the drive, just in case you lose the car in front, then you will have your own trip notes to catch up with the others. Drive B leaves from Black Stallion Motors at 13 Pilgrim Court, Ringwood. We travel to Harkaway and then on to Drouin using the new section of Freeway before turning onto a section of twisting back country roads on our way to Sth. Gippsland. Most of these roads are infrequently travelled, especially during the mid week but watch out for the farmers in their utes and tractors. We will regroup at Drouin before heading into the Hills. Lunch will be at the Royal Mail Hotel in Archies Creek and return to Melbourne via Warragul, Nayook and Yarra Junction with a final run over the top of Mt. Dandenong before we drop down into Ringwood. This is a nice simple drive leaving from Black Stallion Motors in Pilgrim Court, Ringwood and heading for Kinglake, then on to Toolangi and down Chum Creek Road into Healesville. Then on to Woori Yallock, Launching Place and Gembrook to the Ranges Hotel for a lunch stop. After lunch we continue on to Emerald and then follow the back roads to Monbulk then back down the hills via Mountain Highway to return to Ringwood. Click on the Map C link below to see the entire drive in Google Maps. Drive day run from Oaklands road junction near Melbourne airport to Plunkett Winery at Avenal. 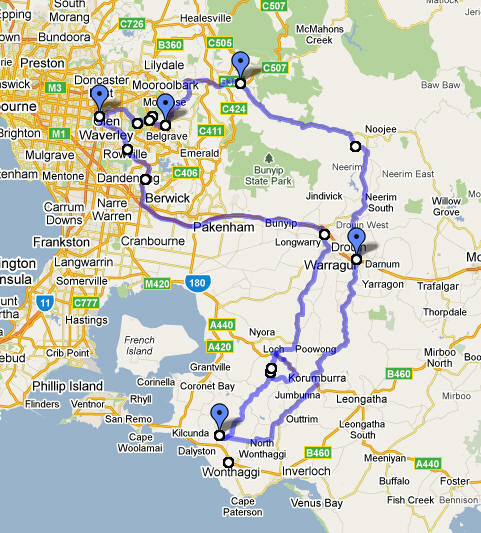 Route via Wallan, Woodend, Lancefield, Pyalong, and Seymour. Return to Melbourne via Hume Freeway. Click on the MAP D link below to be directed to the Google Maps page where you can print off the drive route instructions for this drive. Manhattan Hotel to Marybrooke Restaurant in Sherbrooke. 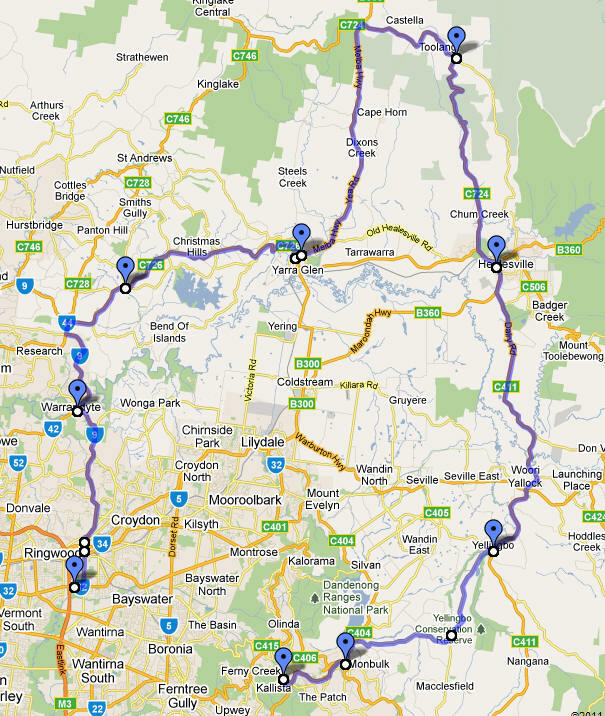 Route via Warrandyte, Christmas Hills, Yarra Glen, Toolangi, Healesville, Woori Yallock, Yellingbo and Monbulk. 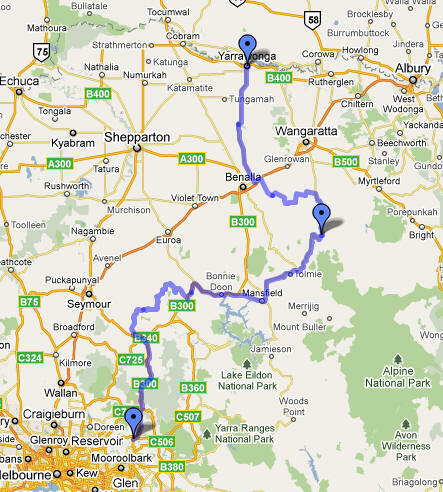 Click on the link below marked MAP E.
Yarra Glen to Yarrawonga via Whitfield.